Said Yousif Almuhafda, head of monitoring for the Bahrain Center for Human Rights, reports that the father of Yousif Al Mowali, a "victim of extrajudicial killing", was arrested on Sunday in Arad, a town on Muharraq island. He was reportedly arrested with several others following a protest. Authorities decided to hold them in detention, although released a child who was arrested with them. Yousif Al Mowali was killed in January 2012. The 23 year old man, who had been diagnosed with schizophrenia, disappeared on January 11th. His body was found two days later, lying on rocks next to the sea. Authorities claimed the cause of death was drowning. However, his body showed clear signs of torture. (Link to GRAPHIC video of his body). A Turkish forensics expert was able to covertly enter the country and examine him. She concluded: “We have proved that the scars on the hands and feet were the scars of electrical torture. The victim was most likely unconscious when he was thrown into the sea and this is why he drowned.” During Yousif's funeral on January 21st, mourners were attacked and plain-clothed security forces violently arrested opposition politician Yousif Qadrat. On April 21st, 2013, vandals desecrated his grave. To date, nobody has been charged with his torture or death. 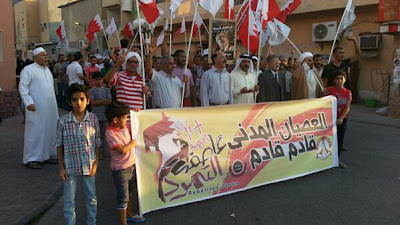 See also pictures from the march in Barbar and a photograph of an "August 14" flag flying at the protest there. 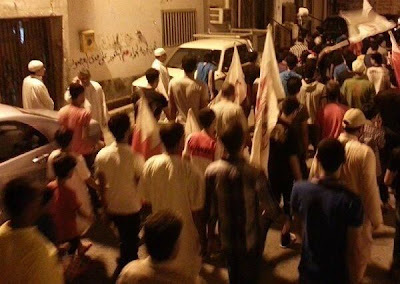 Other protests, with demonstrators banging drums, were reported in South Sehla and AlDair villages. On Saturday, activists defied the ban on protests in Manama issued by the King on Tuesday and demonstrated in the capital, despite a strong police presence. Arrests were reported. "The persistent fear of living in hiding"